General-purpose locomotive painted and lettered for the firm Angel Trains Cargo (ATC), used as Litra 119 on the CargoNet Group, Norwway. Dual system locomotive with 2 pantographs. 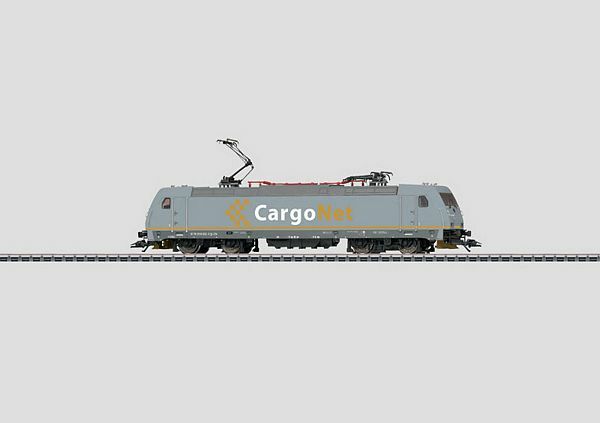 Built by Bombardier as a regular production locomotive from the TRAXX program of locomotives. Model: The locomotive is constructed of metal with many cast-on details. It has a digital decoder and a special can motor. 4 axles powered through cardan shafts. Traction tires. The triple headlights change over with the direction of travel, will work in conventional operation, and can be controlled digitally. The headlights are maintenance-free LEDs. The locomotive has 2 mechanically working pantographs (not wired for catenary operation). Length over the buffers 21.7 cm / 8-9/16. This model can be found in a DC version in the Trix H0 assortment under item no. 22808.